The federal budget saw a new model of funding for vocational training, with the announcement of a skills fund that will support state and territory-led projects that meet defined Commonwealth criteria. The $1.5 billion Skilling Australians Fund effectively replaces the National Partnership Agreement on Skills and aims to create 300,000 new apprenticeships over four years. States and territories will be required to put forward projects, provide matching funding, and achieve agreed milestones. The Assistant Minister for Vocational Education and Skills Karen Andrews told a post-budget breakfast that the fund “marks an unprecedented re-engineering” of how the federal government works with state and territories on VET. “It will only support state and territory-led projects that deliver on the aims of the fund,” Ms Andrews said. The budget also saw a new $60 million Industry Specialist Mentoring Program to support 47,000 apprentices. TDA Chief Executive Craig Robertson welcomed the measures, saying TAFEs were keen to work with the Commonwealth, state and territory governments to help identify projects that meet the government’s criteria. Commonwealth, state and territory ministers will meet on June 2 to commence negotiations about the projects that will proceed under the skills fund. In his Budget-in-Reply, Opposition Leader Bill Shorten promised that Labor would guarantee two-thirds of public vocational education funding for TAFE. He also promised to deliver an additional $637 million in funding to VET, on top of the government’s $1.5 billion skills fund, and establish a $100 million Building TAFE for the Future Fund. TDA Chief Executive Craig Robertson welcomed the promises, saying it demonstrated a strong commitment to the role of TAFE as pivotal to training and apprenticeships. One of the key elements of the federal government’s new skills fund, announced in the budget, is the role it will play in helping ex-ADF personnel transition to civilian life. The Assistant Minister for Vocational Education and Skills Karen Andrews said the fund would support projects that helped ease the adjustment faced by veterans. “The focus of the projects will also be on supporting former Australian Defence Force service men and women to transition out of the services into an apprenticeship or traineeship pathway,” Ms Andrews said. The announcement follows the ADF skills and apprenticeships forum in Canberra in March, jointly hosted by TDA and the National Apprentice Employment Network. The Australian National Audit Office (ANAO) has cleared the Department of Education and Training over the way it administered grants for a pilot program to test alternative forms of apprentice training. Following an inquiry, ANAO said that the department established the Apprenticeship Training – alternative delivery pilots program in December 2015 in accordance with Commonwealth grants rules and guidelines. As part of the program, the department awarded a first stream of grants for up to $1.84 million each to Master Builders Australia, the National Electrical and Communications Association, and the North East Vocational College (NEVC), a college associated with former Family First senator Bob Day. ANAO said that a report by the government’s Apprenticeships Reform Advisory Group had recommended against supporting Senator Day’s NEVC proposal. However, ANAO said the first stream of funding was a closed non-competitive process which was permissible under the guidelines. Australian test cricketer Nathan Lyon has been named as the latest high-profile figure to become an Australian Apprenticeships Ambassador. The former apprentice groundkeeper at Canberra’s Manuka Oval joins figures including celebrity carpenter, Scott Cam; AFL legend and former plumber Kevin Sheedy, stylist to the stars, Renya Xydis, and former Canberra Raider Alan Tongue. Lyon commenced his apprenticeship, studying a Certificate III in Horticulture (Turf) at Canberra Institute of Technology, before becoming a curator’s assistant at Adelaide Oval, and then an outstanding cricket career where he has taken 247 test wickets. Nathan’s was hugely popular speaker at the 2016 TDA convention gala dinner in Melbourne last October. Congratulations Nathan from everyone in the TAFE community! With approximately 80% of Chinese students returning home after graduation, Chinese students need increased support from Australian institutions to help them find internships and employment. The Australia China Careers Fair Roadshow aims to service these students and graduates and demonstrate the commitment of Australian providers to serving the career needs of this key international cohort. Following the success of past Careers Fairs delivered by the Australian Chamber of Commerce Shanghai (AustCham Shanghai) and the Australian Trade and Investment Commission (Austrade), the two organisations are joining forces to host the Roadshow in Shanghai and Beijing from June 30 – July 2, 2017. The careers fairs in China’s two largest cities will take place during the student vacation period and support the career development of both current Chinese students and graduates of Australian institutions by linking them with key Chinese and Australian businesses operating in China. Austrade China is keen to see increased participation from Australian TAFEs in the Careers Fair Roadshow. If TAFE institutes are interested please contact either Jen Bahen (jbahen@tda.edu.au) or Rhett Miller, Austrade Shanghai (Rhett.miller@austrade.gov.au) for further information. The Australian Training Awards are the peak, national awards for the vocational education and training (VET) sector, recognising individuals businesses and registered training organisations for their contribution to skilling Australia. Enter directly to the Australian Training Awards by completing the nomination from the website. Applications close Wednesday 31 May 2017. Political instability prevails, with the election outcome too close to call and the VET sector in a state of uncertainty after eight weeks of campaigning. For the tertiary education sector, the uncertainty is compounded by a curious lack of policy commitment from the Coalition, which did not release any training or skills policy or new initiatives during the campaign. In higher education, it’s a similar situation with the coalition policy subject to the views of an expert panel flowing from a discussion paper. For international education, there will be more changes, with the Minister for International Education, Senator Richard Colebeck set to lose his Tasmanian Senate seat. The VET sector and TAFE face a great deal of uncertainty flowing from the ambiguous policy environment and the uncertain leanings among many of the new parliamentary players. The media reporting of the number of seats won by the various parties is quite curious: the ABC, for example, is reporting the Coalition has won 68 seats, Labor has won 67, Greens 1, Xenophon Team 1 and others (Katter, McGowan and Wilkie) 3, which leaves 11 still in play. Other media outlets are reporting along similar lines. For good measure, Fairfax has the national two party preferred (2PP) vote at 50.07% Coalition to 49.93% Labor. That’s not what the Australian Electoral Commission is reporting: for starters, it ‘s got the 2PP, as of Sunday, at 50.23% for Labor to 49.77% for the Coalition, with Labor on track to win up to 73 seats (that may not happen, of course, as pre-poll, absentee and postal votes are counted) with the Coalition at 70. Five electorates are deemed too close to call, with Labor leading in 2 and the Coalition in 3. One of those seats is Chisholm in which the Coalition leads by just 66 votes but the media uniformly consider it will go to the Coalition. Don’t see that at all: Labor had an intensive “boots on the ground” operation going during the pre-poll and for a substantial part of the pre-poll period Labor was leading 51% to 49% in the opinion polls. Could cut either way: the Coalition could end up with 75 seats or Labor could end up with 75 or some other permutation – all short of a majority – such as 72 seats each and 6 crossbenchers. What all the media seemed to have missed is that there is a strong possibility that a second Xenophon Team candidate will get up in South Australia, in Grey, on the back of Labor and Greens preferences. We will have a clearer idea tomorrow night. The number of apprentices across Australia has plunged since the Coalition took office, government figures show, with some of the steepest falls occurring in high-unemployment marginal seats still up for grabs at Saturday’s election. Western Sydney has lost 10,642 apprentices and western Melbourne 4782, while the national total fell 28 per cent from 383,562 to 278,583, between December 2013 and December last year, documents obtained under Freedom of Information and NCVER data reveal. Labor claims the falling take up of apprenticeships is a direct result of the $1 billion stripped from trades support programs since the change of government, including the abolition of the ‘Tools for Your Trade’ (TFYT) program – which paid $5500 to apprentices over two years – and other training and mentoring programs. The Coalition replaced the program with a loans scheme which has been taken up by just 40,000 apprentices in the past two years. Labor proposes to reintroduce TFYT as a grants scheme of $3,000. Concern at the dearth of apprentices in the system in 2016 extends beyond the complaints of Labor and unions, with Australian Industry Group chief executive Innes Willox recently describing the proportion of apprentices and trainees in the workforce as “worryingly low” at just 2.7 per cent. The Ai Group called for apprenticeships to be “put at the top of election platforms” for both major parties. The Coalition has not announced any apprentice-specific policies during the election but the Minister for Vocational Education and Skills, Scott Ryan, said the Youth Jobs PaTH Program, announced in the budget, “helps equip young job seekers by getting them ready” for employment. But the Turnbull government claims Labor “gutted” the apprentice system by repeatedly cutting employer incentive payments between 2011 and 2013. The current GDP of Australia is around $1.4 trillion roughly $US1.1 trillion: we would see a present value of gains of nearly $US4 trillion – about 4 times current GDP. Sounds like a lot to me, even over the expected lifetime involved over someone born today (which is the timeline adopted). Bill Shorten stands accused of misleading voters over the boost to growth from his $37.4 billion school funding plan by claiming an economic lift “straight away” from the spending despite economic ¬research that shows the gains would take decades. n a blow to the Opposition Leader’s economic case, the author of the global study used to justify the Labor spending told The Australian there would be no “immediate” boost to growth — and that more money was not the key factor in producing the economic benefit. Parents frustrated by their children’s (and in some cases their children’s teachers’) inability to spell will be underwhelmed by Bill Shorten’s faux promise that Labor’s promised $37.3 billion spending splurge on schools would produce an economic dividend — in 2095. Such a ludicrous, extravagant plan not only defies fiscal reason, it fails to address the pressing shortcomings of our education system. … the Australian Council for Educational Research is the latest organisation to point out why spending more is not the answer to better educational outcomes. The challenge, identified by ACER chief executive Geoff Masters in a new report, Five Challenges in Australian School Education, is better application of existing government funding based on evidence-based strategies. Three-quarters of Australia’s fastest growing industries need graduates with strong science, technology, engineering and maths skills. Secondary students’ participation in physics and advanced maths, however, has declined steadily for 20 years. Fewer than 10% of Year 12 students study advanced maths. Fewer than 15% take physics. Ok, it was silly of Labor to claim that “dividends” from its proposed unprecedented “investment” in education would be immediate. Of course they won’t, as Labor has now conceded. But to the extent that benefits do flow, they will flow sooner, as well as later, and potentially with a far greater economic pay-off than other initiatives announced in this campaign. For example, the pay-off from the Coalition’s proposed cut in business tax over ten years from 30% to 25% over ten years, at a cost of $48.2 billion, amounts to “eight tenths of bugger all”: an improvement in economic output – or GDP – of just 0.1% per year and that’s after year 10, 2015-26. 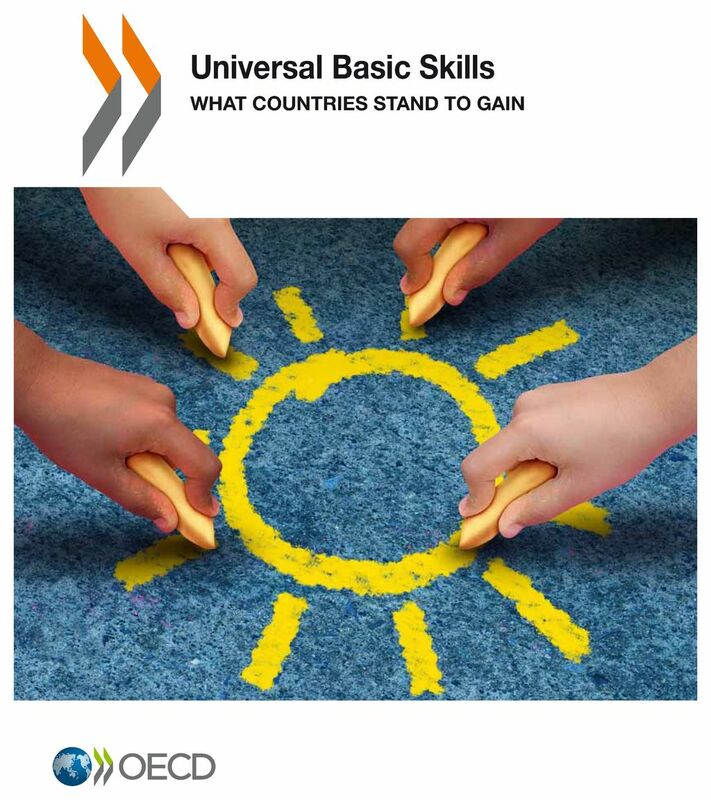 As set out above, the OECD projects that getting to “universal basic skills” has a payoff five times than that over the longer term. Thirty years from now, the benefits of universal skills coming out of schools would be more than twice the value that Treasury estimates out of a company tax cut… Economic gains from education take time to flow through. They start to flow when students leave school with better skills. And those gains then build over time. Adequate school funding is essential. But money alone is not the answer; we have increased spending on schools and still seen standards decline. We urgently require a national action plan to target resources on proven, interconnected strategies for arresting the drift in our schools (emphasis added). ….is to reduce current disparities in the schooling experiences of students in Australia’s most and least advantaged schools. The general challenge is to ensure that all students receive a high-quality education regardless of where they happen to live or the school that they happen to attend. It might be concluded from this observation that better funding is not the answer to better educational outcomes. However, a number of other countries have succeeded in raising the performances of their schools at the same time as performances in Australia have declined. This suggests that whether or not increased funding makes a difference depends on how it is applied. Our national challenge is to maximise the impact of government expenditure by targeting it on evidence-based strategies to improve performances in Australian schools (emphasis added). The Australian opines that what is required is better application of existing government funding based on evidence-based strategies (although it does approve of Labor’s proposal to spend $400 million to improve the teaching of STEM subjects). Well, if that’s the case, the starting point has got to be redistributing the substantial amounts of government funding going to Australia’s wealthiest schools (“class warfare” as The Australian would depict that). The Age recently reported, for example, that some of Victoria’s wealthiest private schools have reaped huge government funding increases, while disadvantaged public schools have been hit with cuts. 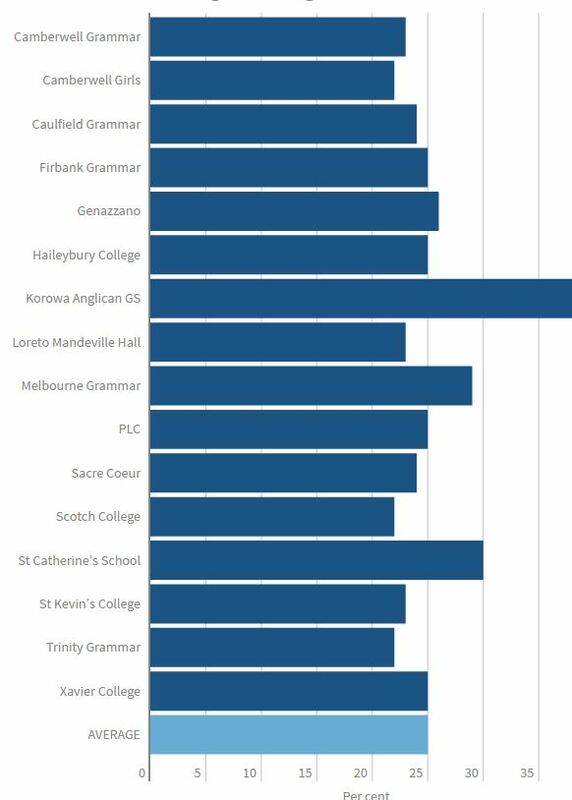 The graph illustrates the bounty reaped by such schools in recent years. 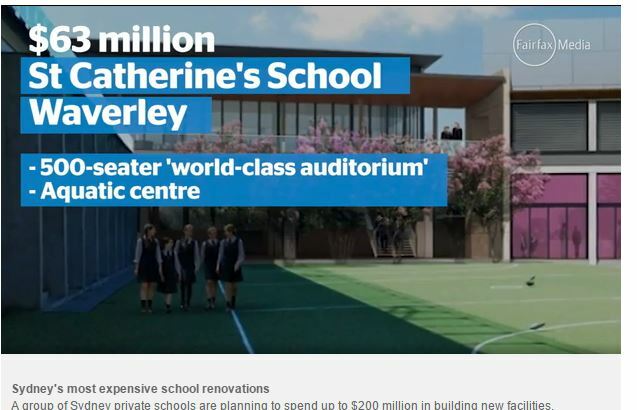 Twenty of Sydney’s wealthiest private schools received $111 million in taxpayer funding last year, new data has revealed, allowing the institutions to subsidise plans for tennis courts, flyover theatre towers, and Olympic pools with underwater cameras. The so-called “renovations” at St Catherine’s School alone would funding the building of 3 or 4 good sizedand well equipped government schools (albeit, without lap pools and world class auditoriums). St Catherine’s had a net income in 2014 of about $30 million, including $6 million in Commonwealth and State funding. Stephen Parker, the soon to retire vice-chancellor of the University of Canberra, was an implacable opponent of the Coalition’s university deregulation package. But from being a red hot issue during most of the last term of Parliament, higher education has hardly figured in the election campaign. The Coalition has slipped the electorate a mogadon and seemingly gotten away with it. The mogadon will wear of after the election, should the Coalition returned. In the Budget on 3 May, and in an options paper released that night, it became clear that the 20% cut to the CGS – basically teaching grants – remains policy, albeit deferred for one year. The forward estimates assume it, and the return to surplus timeline – an election plank – relies on it. After the election, we are told, consultation will be carried out over some options, such as fee deregulation for “flagship” courses and re-balancing commonwealth and student contributions. We are assured, however, that “full” deregulation of domestic student fees has been dropped for good. The best one can make of this is that Liberal policy has, as its starting point, a cut of 20% to university teaching grants (being the major component of higher education expenditure cuts amounting to $2.5 billion over the forward estimates), but the actual cuts might turn out to be less if students are required to pay more. The increase in student payments might be softened if the 2014 expenditure policies to extend HECS places to sub-bachelor places and private providers are dropped, but the conclusion is inescapable. Unless students are required to pay significantly more, universities will face major cuts. Worse for universities now than under Pyne? 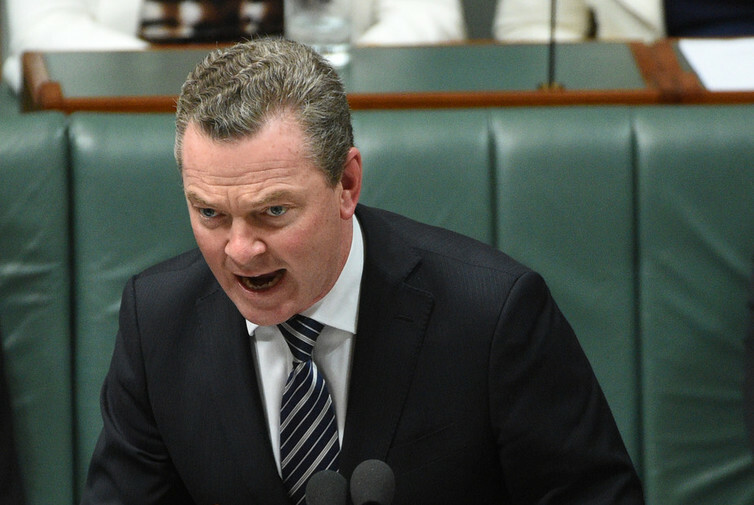 Is higher education in a worse position now than when it was under Pyne? Arguably the 2016 situation is worse for universities than the 2014-15 proposals, because it is not at all clear that the cap on domestic student fees will be raised sufficiently to compensate for the 20% cut in government funding. On average, it is thought, an increase in student fees of about 30% would be required to compensate for a 20% reduction in commonwealth funding. Education Minister Simon Birmingham could not, however, bring himself to say the words “20% cut” when interviewed by David Speers on Sky News. Until recently, it was possible that the new option of limited fee deregulation might still have put universities in a better position than the proposed cuts would suggest. Then the prime minister weighed in. In the Leaders’ Debate on 17 June, Malcolm Turnbull made clear that deregulation would only be for a “small number” of flagship courses. So what had been only an option was now upgraded to policy. Given all this, why have Labor (and the Greens, and Nick Xenophon) not made more of an issue that was clearly playing well for them in 2014-2015? After all, universities will face major cuts which will only be substantially alleviated if students are slugged instead. And if universities are not to be cut at all, the student fee increases could be as much as 30%, which sounds like the sort of thing that students might protest against. Are they just relieved it isn’t 300%? One possible explanation is that it takes two to tango, and with the Coalition keen to keep higher education out of the campaign there is only so much traction to be had by repeated references to it. The government presumably knows that it is unlikely to win any new votes in this area but it has considerable potential to lose existing ones, hence the silence. Another explanation is the view that the two major parties have much in common on higher education. Another is that news editors do not think higher education is sufficiently front of mind for electors to warrant extensive coverage in the general media, particularly if no one is occupying a university administration building at the time. Another is that even with the 24/7 news cycle there are only so many column inches or air-time minutes available, and events in Europe and the US have been using up oxygen. Whatever the explanation, it is a lamentable situation. Universities are vital to the future of a civilised and prosperous society. They face very significant cuts which could only be fully averted if students pay more. But Australian students already pay a higher proportion of the costs of their education than in much of the developed world. One could be forgiven for not protesting in 2013, when Tony Abbott looked into the camera shortly before the election and said there would be no cuts to education. But now we know there will be cuts if they are re-elected (it won’t be a breach of an election promise) and no one is protesting. It is a curious incident. The Coalition has pushed consideration of proposed university reforms, including a 20% cut in funding, out beyond the election, until 1 January 2018, but it has ruled out full fee deregulation. It has released an options paper, to guide a consultation process, canvassing a range of alternative fee measures. That’s it. The Coalition has proposed a set of tougher measures to fix the VET FEE-HELP blow-out in a discussion paper released on 29 April. The present minister for vocational education and skills senator Scott Ryan said the paper will pave the way for a full redesign of the scheme. Announced in the 2016 Budget, to come into effect from 1 April 2017, Youth Jobs PaTH provides young Australians with intensive pre-employment skills training followed by an internship placement. Up to 30,000 job seekers each year will gain a four to twelve week placement in an industry of their choosing. Job seekers will receive $200 per fortnight on top of their regular income support payment while participating in the internship. Employers who hire an eligible young job seeker in an ongoing job will receive an accelerated wage subsidy of up to $10,000, paid over six months. In an address to the National Press Club on Wednesday 22 June 2016, the leader of the National Party, Barnaby Joyce, announced that the government would spend $152 to improve access to educational opportunities for regional students. The Coalition will spend $83 million to reduce the period of time from 18 months to 14 months that regional and remote students need to be employed in order to qualify for independent (self-supporting) status for Youth Allowance and ABSTUDY. In addition the Coalition Government would also provide $24 million for 1,200 new Rural and Regional Enterprise scholarships for undergraduate, postgraduate and vocational education students to undertake STEM studies. The scholarships will be valued at up to $20,000 each. Malcolm Turnbull announced on Friday 24 June 2016, that government would provide an additional $150m in funding to help the University of Tasmania relocate in Launceston campus to Inveresk as well as boost the provision of tertiary education in north-west Tasmania. This matches the ALPs April promise of $150m for the university relocation. Private education and training is the preferred choice of more than 50 per cent of students across Australia. It is highly innovative and responsive to the needs of industry. More than 2.2 million students choose to complete study or training with private providers in Australia. The Student Choice Counts campaign is mobilising the community of students, employees and supporters of the private education and training sector against any policy change to limit student choice and undermine the viability of an important and competitive industry. Liberal and National parties and the ALP have announced major reviews and consultations into training and higher education. ACPET supports these measures but we need to make sure that outcomes do not penalise current or future students. Students must come first. ALP policy announced during the election campaign would see an arbitrary cap on HELP training student loans, jeopardising student choice and affordability. The ALP has also strongly indicated its intent to direct at least 70 per cent of funding to Government-owned TAFEs, stripping students of their right to study at their college of choice. TAFE alone cannot deliver the range of courses, to the number of students, in metropolitan, regional and rural locations across the country. We support effective requirements to ensure only high quality providers can deliver public funded training. 24 June 2016 | Tertiary students studying at private higher education institutions are being unfairly and harshly penalised for their choice, according to the Australian Council for Private Education and Training (ACPET). ACPET CEO Rod Camm said students choosing private higher education providers were charged a 25 per cent fee payable on their student loans and denied access to Commonwealth Supported Places (CSPs). ACPET is calling for both the Australian Labor Party and the Coalition to remove the 25 per cent fee payable on loans obtained through FEE-HELP which does not apply to university students accessing HECS-HELP. This reform would not only support greater student choice but address a fundamental inequity that has financially penalised some students simply because of their choice of higher education provider. This fee is simply indefensible…. [ READ MORE ]…. 23 June 2016 | Students from disadvantaged backgrounds risk being shut out of training under policy announced by the Australian Labor Party, according to the Australian Council for Private Education and Training (ACPET). ACPET CEO Rod Camm said that students whose only access to diploma level training was through student loans faced being shut out once more if proposed arbitrary caps on loan amounts were introduced. ACPET says that under Labor’s proposed $8,000 cap on training loans, many students from disadvantaged backgrounds will be turned away from training because they cannot afford to pay up-front fees. Camm says that ACPET members are concerned that, for many disadvantaged students, the threat this election is not just to choice, but their ability to access any sort of diploma level training at all…. [ READ MORE ]…. 17 June 2016 | The training choice of 2.2 million Australian students is at risk from outdated and ill-informed rhetoric from the Greens. The Australian Council for Private Education and Training (ACPET) CEO Rod Camm said private training providers were an absolutely essential component of Australia’s training sector and the Green’s policy to stop all government funding to private providers posed enormous risk. The Australian training sector would collapse if private training providers were removed from the sector, he said…. [ READ MORE ]…. 16 June 2016 | Australia needs a diverse higher education and training sector with quality private providers delivering choice and quality outcomes for students and employers. Australian Council for Private Education and Training (ACPET) CEO Rod Camm said student access to government funded training through quality private training providers was critical to meeting the future skill needs of Australia’s economy. “Private training has matured over the past 20 years and is the choice of employers and more than 2.2 million, or 57 per cent of Australian students, every year,” Mr Camm said. “Private training delivers strong job placement outcomes and delivers more flexible training options.”…. [ READ MORE ]…. 15 June 2016 | Private training providers have expressed their surprise and concern at yesterday’s Australian Labor Party (ALP) policy announcement to provide pre-apprenticeship training for 10,000 young people and to assist retrenched workers get their trade skills formally recognised. Australian Council for Private Education and Training (ACPET) CEO Rod Camm said that while improving pathways into apprenticeships was an important element in boosting the nation’s trade skills and providing real jobs, ACPET had considerable concerns about what the policy was really trying to do. “Continuing economic uncertainty and government training cuts have reduced the opportunities especially for our young job seekers” he said. “While the policy intent is supported, the ALP has missed an ideal opportunity to drive home the employment outcomes from this program by using private sector training providers. Put simply, private colleges have a proven ability to provide superior employment outcomes for job seekers and the ALP’s decision to only allocate funding to Government-run providers is a serious limitation.”…. [ READ MORE ]…. 9 June 2016 | Flexible learning, quality study programs and industry standard training are at risk for more than 2.2 million Australian students studying with private higher education and training providers each year. Australian Council for Private Education and Training (ACPET) Chief Executive Officer Rod Camm said private providers were an essential element of Australia’s higher education and training sector, offering students a wide choice of courses, flexible delivery options and access to industry professionals. “There are countless examples of how our members are meeting demand from Australia’s students and employers, right across the country,” he said…. [ READ MORE ]…. 8 June 2016 | Private training providers support the Australian Labor Party’s policy announcement to boost apprenticeship numbers if it wins the upcoming federal election. Australian Council for Private Education and Training (ACPET) CEO Rod Camm said apprenticeships and traineeships were key elements in providing jobs and skills, particularly for young people. “A combination of subdued economic circumstances and government training cuts have produced decade low levels of commencements which is reflected in the high unemployment levels amongst young job seekers,” he said. “Harnessing the government’s infrastructure program to boost apprenticeships and traineeships is an important step in boosting opportunities for those seeking a trade career.”…. [ READ MORE ]…. 27 May 2016 | Australia’s 2.2 million private education and training students are being urged to stand up for their right to choice during the Federal Election campaign. The Australian Council for Private Education and Training (ACPET), the national industry association for independent providers of post-compulsory education and training, is mobilising member, employer and student networks to address policy changes that would limit student choice and undermine the viability of a competitive industry. ACPET Chief Executive Officer Rod Camm said private education and training in Australia delivered jobs and growth, and provided nationally accredited and portable qualifications that delivered massive outcomes for the economy. However, the sector is under threat from reactionary policy changes that would punish both students and good quality private providers. “Policy announcements including an intention to direct the vast majority of vocational training funding to Government-run TAFEs and an arbitrary $8,000 cap on Help loans will strip students of their right to study at their college of choice,” Mr Camm said. “Suggestions that at least 70 per cent of funding will go to a Government-owned provider and that government will choose the courses that will be funded, and at what price, can only lead to another major public policy failure…. [ READ MORE ]…. 24 May 2016 | Students and industry would be the big losers under a Greens Party policy to lock out all private training providers from vocational education and training. Australian Council for Private Education and Training (ACPET) CEO Rod Camm said the proposal put forward by the Greens would be a disaster taking away students’ right to choose their training provider and their preferred course, whilst unfairly punishing high quality private training providers right across Australia. “This type of policy is exactly what ACPET is urging all parties to avoid this election. Students should be able to choose exactly where and what they want to study,” he said…. [ READ MORE ]…. 6 May 2016 | The Australian Council for Private Education and Training (ACPET) has today warned that good quality training providers will be the victims of Labor’s unfair training loan caps, announced in Opposition Leader Bill Shorten’s budget reply speech overnight. ACPET CEO Rod Camm has today questioned how such arbitrary change could be fair on students, and warned that a government imposed price of $8000, with no reference to market forces, would punish good quality private training providers and put thousands of jobs in the private training sector at risk…. [ READ MORE ]….